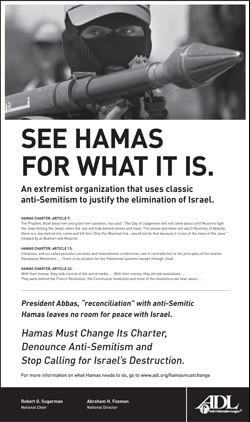 The ADL, the nation’s premier civil rights organization is running ads in The New York Times, The Washington Post and the International Herald Tribune calling attention to what Hamas is. This is in light of the reconciliation between Hamas and Fatah. The PA has declared that they will unilaterally seek statehood recognition at the UN on September. Hamas, who rejects Israel’s right to exist and is openly Anti-semitic (among many other things) would become part of the government of such state. Check out the ads by clicking on the image below and feel free to spread them.